For the fourth year running, our second year BA Set Design for Screen (now BA Production Arts for Screen) students are collaborating with the BFI for their Future Film events series. Each event focuses on a different area of the film industry, and they are designed to help young filmmakers learn more about their craft. 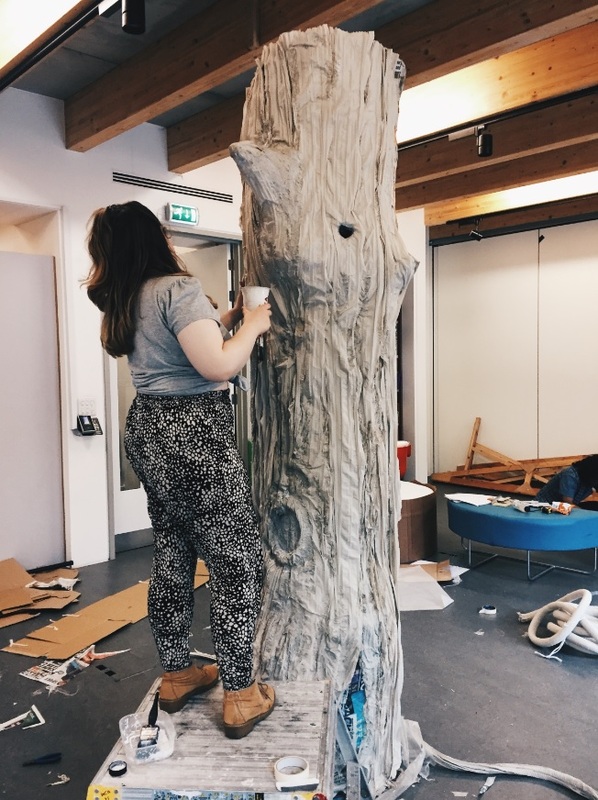 This year, the students will be working with the BFI to create a forest set for the ‘Virtually Summer’ event taking place throughout August. The set will feature elements of virtual reality to create a truly immersive experience for visitors. 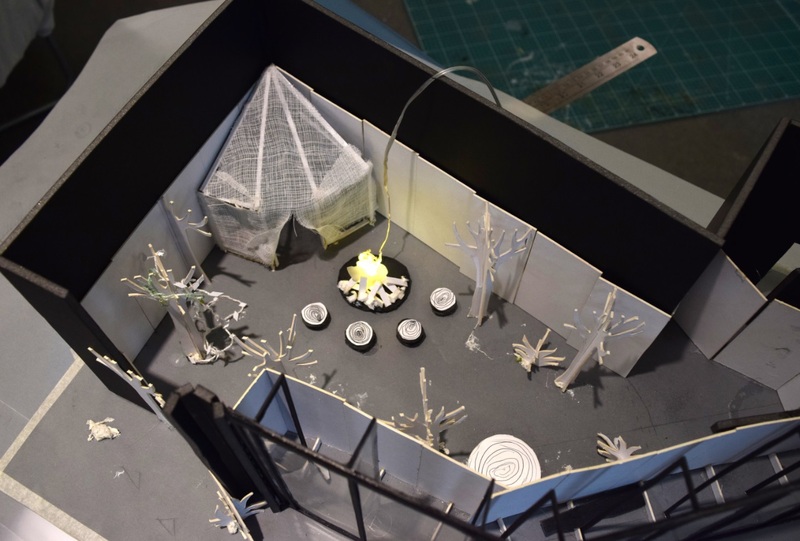 We spoke to second year Set Design for Screen students, Julian Leonel and Stefanie Goh about their design concept for ‘Virtually Summer’, what skills they’ve acquired through working on this project and their advice for young people who are interested in a career in set design. Can you describe what the BFI Future Film event is? Julian: BFI Future Film is a festival hosted by the BFI where they collaborate with film students and other amateur filmmakers, and they exhibit their work and showcase it to a larger audience. It’s really beneficial to be a part of the festival as a student, because your work is seen by so many people who might not have had the opportunity to see it. Stefanie: This collaboration between Set Design for Screen students at Wimbledon and the BFI has been going for a number of years, and each year they work on a different space which is built over the summer and up and running at the BFI for the month of August. What the BFI asked us to do this year is design a ‘Virtual Summer’ space for them. They want us to create a space which looks like a film or TV set on its own, but at the same time it can double up and be used to conduct workshops for young filmmakers. Julian: In previous years, the sets the students designed were actually used to make films, but this year the focus is more on an exhibition and workshop space. Stefanie: The point of our ‘Virtually Summer’ project is to introduce people to virtual reality, as not a lot of people really know about it. The BFI want us to create it in a fun and engaging way that is accessible to lots of different types of people. The event is open to the public so anyone can come along! What is your design concept for Virtually Summer? Stefanie: The theme of our design is ‘Woodland Walk’. We want to use this opportunity to highlight the processes that go in to a set design for film and TV, not just the finished product. Using the BFI space, we are splitting it into three different areas. When you first walk in, you’ll be introduced to a white card model set, which is a tool that a lot of filmmakers use; it’s actually one of the first tools you use in the art department on a film set. 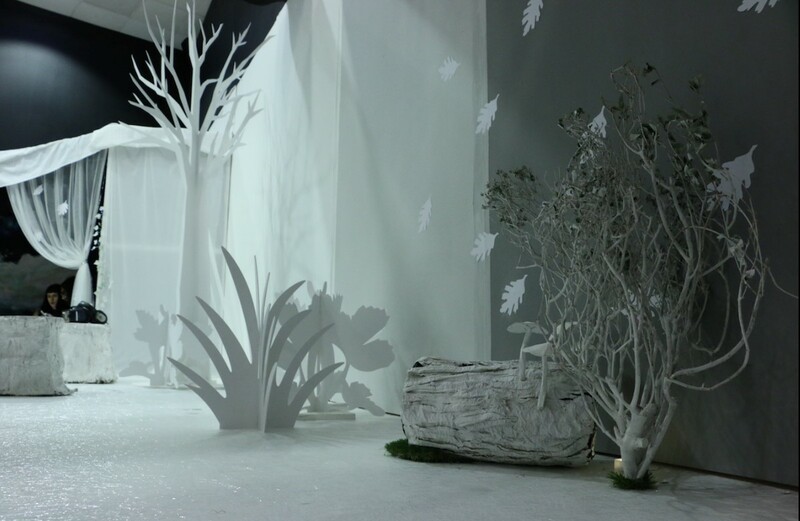 As you walk through the space, it transitions from this white card model into a more realistic version of the forest. We wanted to demonstrate to visitors that making a film isn’t something that can be done overnight; it’s a long and involved process. This is also why we have created an Instagram page for the project, to highlight the processes even more and show our work in progress. Often times with set design, people just see the final product and they say, “wow, that looks amazing”, but they don’t truly understand the amount of time and work that goes into creating these sets. I’m excited to present visitors with a different perspective with our ‘Virtually Summer’ set. Julian: I think the main focal points of the set will be the trees. We are creating eight foot tall trees made out of Foamex (a PVC foam sheet that is fabrication friendly) that are completely three dimensional, so they will look very eye-catching in the space. 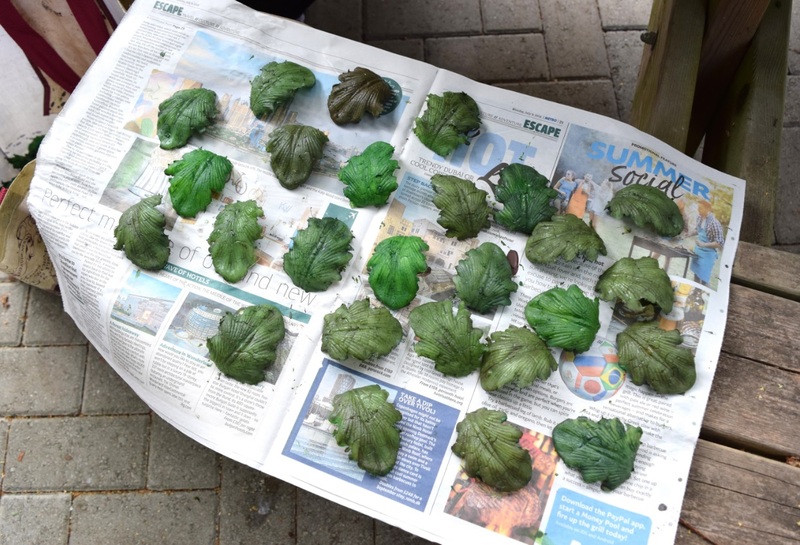 We’re hoping to make it look as realistic as possible, so on the large tree we will dangle some fake leaves that we are making ourselves. We want the space to feel immersive, as if you are sitting under a real tree. We will also have a tent and a campfire, with stools around it made to look like tree stumps of varying sizes. 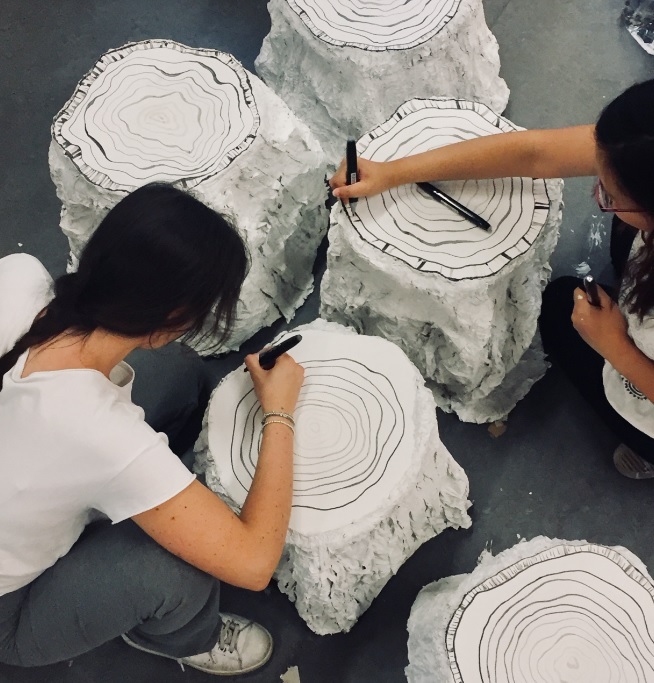 Stefanie: The tree stump stools are designed to be light and moveable so visitors can move them to where they want them. Ideally, we want them situated around the campfire. By creating the tent, we have made a large open space where the virtual reality programmers can add anything they want. What skills has organising the project given you that will be useful in your careers? Julian: It’s been really useful for us to see a whole project from the very beginning of design ideas, planning and organising, sourcing materials and budgeting. I think it’s also improved my teamwork skills. We’ve all picked up many different skills that we will be able to take forward in our careers by working on this project. Stefanie: It’s given us a nice mixture of social and practical skills. Previously, what we have been learning was a lot more theoretical. We have worked with budgets before but not actually handling money, whereas this is actual money, we have to make sure we don’t go over budget. The project has also taught me how to work towards a deadline, working on a project of this scale is very different from university; there are no extensions! Julian: It’s also taught us how to create networks outside of the university. We have been calling people asking if they can provide any free materials or give us advice, we’ve had to organise transport of our work and we’ve tried to get discounts or deals on certain things to make the project more affordable, so it’s made us more confident with building relationships and negotiating. Have you been working in any of the workshops or with the technicians on this project? Stefanie: We have been using the workshops a lot on this project. When making the campfire and tree stumps, we went to the metal workshop to cut the stools to the right size. 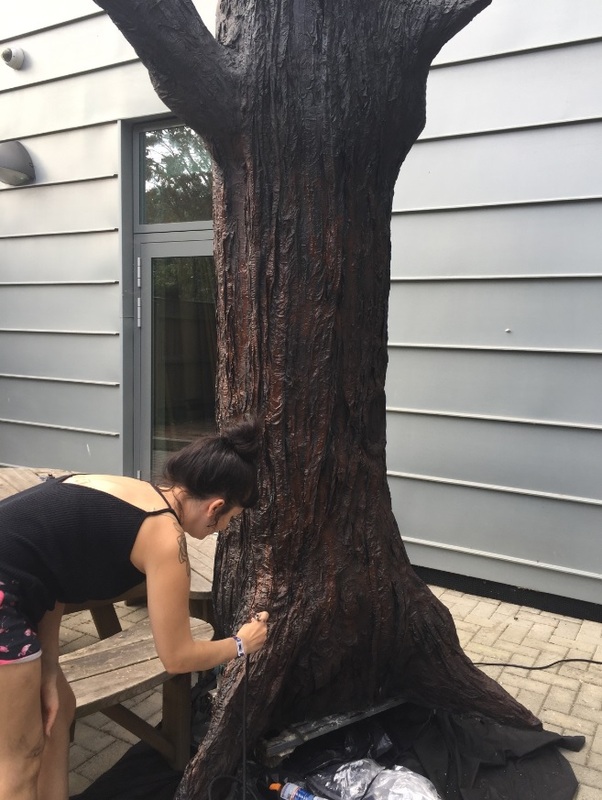 For the tree, we drew the technical drawings of what we wanted to make and then went to the wood workshop and asked the technicians if it was feasible. We can make really outrageous designs on our course normally because we aren’t designing something to be built. For the Future Film project all of our designs have to be built to specifications, so we have learnt a lot of things about height requirements and health and safety considerations. For example, the space needs to be accessible by people in wheelchairs, which is something we had never thought about before. The technicians were really helpful in letting us know if, given the timeframe, our designs are possible to create or if not, they would help us simplify the designs and make them more structurally sound. What have you enjoyed the most about studying Set Design for Screen? Julian: I’ve enjoyed finding out more about an industry that not many people know that much about. It’s interesting for us to see the behind-the-scenes of what goes into making a film, and it keeps us inspired to push forward and gain as much industry experience as we can. Stefanie: My favourite part of the course has been making the white card models and showing them to people, because a lot of people can’t really visualise your idea when you just explain it to them, but when you show them a 3D model they can start to understand your vision behind a project. Julian: I’d like to do anything within a film or TV art department, really. I want to get as much experience as possible in lots of different areas, whether that’s graphics, being a runner or learning about prop hire. I just want to get skills in as many areas as possible that I can build upon. Stefanie: Right now my focus is to get as much experience in any department in the film industry, and then hopefully after a few years I would work my way up and be a production designer. That is my goal. What advice would you give to a prospective student interested in set design? Julian: I would advise students to come onto the course with a wide knowledge of different film genres. If you have one specific genre you’re interested in, you should try to broaden your perspective to include lots of different genres because each genre has different set design elements. Also, the skills you’ve learned during school will come into the course more than you think. There is quite a lot of maths involved in set design, so I wished I was a bit more confident with my mathematical skills when I came onto the course. Also, a good knowledge of certain digital programs would be really useful; Photoshop, Google SketchUp and AutoCAD. If you have a few of those basics down already, you will be in a good position when starting the course. Stefanie: I would say drawing and sketching is really important, too. Drawing and using digital programs I would say are the most useful skills you can bring, but I came to this course not knowing anything and I am still surviving! The course teaches you all the necessary things that you need to learn, it’s just that you do have to pick it up quite fast. So if you are really motivated, I would say learn more about certain things in your own time. Find out more about the BFI Future Film ‘Virtually Summer’ project on the BFI website. You can also follow our students on Instagram to see their work-in-progress photos in the lead up to the event. BA Set Design for Screen is now called BA Production Arts for Screen. Learn more about the course on our website.